I first became acquainted with Dr. Creed in 2003. I had recently returned to practice after 4 years on disability from injuries resulting from simply working too hard. I was told that I should not practice again or risk doing more damage to my already permanently injured spine. The problem was that I love practicing chiropractic, but I needed to modify my technique approach to be easier on my body and allow me to practice without re-injuring myself. Advertisements for Dr. Creed’s Neural Kinetic Integration Technique caught my attention. A telephone conversation with him assured me that his work was worthy of further investigation, so I signed up for one of his seminars. One weekend with Dr. Creed allowed me to introduce his Neural Kinetic Integration Technique into my practice. It was truly transformational. I was able to seamlessly incorporate it with the Spinal Biomechanical Engineering and SOT, which I had used with great success for over 30 years. The aspect that was so exciting was that it improved my results and the patients experience, while reducing the stress on my body. It is now my pleasure to introduce my friend and esteemed colleague, Dr. Alan Creed. KOCH: Alan, you’ve been practicing, teaching and evolving your work for over 30 years. You have overcome your own serious, life threatening health challenges. In spite of all this you have the energy and enthusiasm of a teenager. What is your driving force? CREED: That’s easy to answer Bill. I love chiropractic. A chiropractor gave me back the use of my legs after a serious automobile accident that crippled me for eight years. I spent two and a half years in and out of hospitals. Chiropractic has given me a great life, enormous satisfaction and material success. I am here to give back to the chiropractic profession and their patients. KOCH: What steered you in developing your Neural Kinetic Integration Technique? 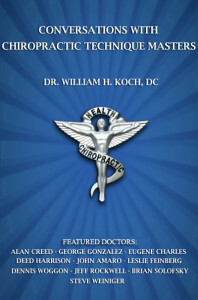 CREED: Having personally experienced a chiropractic miracle inspired me to become doctor of chiropractic. Then, because I wanted to become the best chiropractor I could, I studied more than 30 chiropractic techniques. I spent many years following Dr. George Goodheart around the country. I studied with Dr. De Jarnette, Dr. Vernon Pierce, Dr. Don Harrison, Dr. Victor Frank, Dr. David Walther, Dr. Roy Sweat and Dr. Ted Carrick to name a few. Each of them provided valuable information, science and insights that have contributed to my understanding of functional anatomy and neuro-physiology. KOCH: I studied with many of the same people, Alan, so I can really appreciate the amount of time, energy and study it takes to develop proficiency in their techniques. But you have gone beyond that and have developed your own technique, Creed Neural Kinetic Integration Technique. Would you please describe for our readers exactly what that is? CREED: The Creed Neural Kinetic Integration Technique employs pre and post applied functional testing protocols. These protocols allow the doctor and patient to identify the aberrant conditions prior to treatment and acknowledge in most cases, the immediate positive changes after treatment. Creed Neural Kinetic Integration Technique’s major focus is full body postural alignment that also provides for proper neurological balance. When we correct the posture we re-orient the musculo-skeletal structure. This establishes a foundational platform for correct alignment of the head over shoulders, shoulders over hips, hips over knees and ankles to support the patient’s natural bipedal stance. The result is a reduction of the gravitational loads on all weight bearing structures. Improved postural information is then transmitted to the cerebellum for better motor control. Patients come to us because they are in pain and/or because of impaired physical performance. We use muscle testing to gauge functional capacity, and are thus able to assess the corrective process and adapt our corrections accordingly, resulting in positive structural changes, reduced pain and enhanced functional ability. KOCH: Great stuff, Alan. Keep going, you are on a roll. CREED: These structural enhancements help to re-orient the facet plane angles. Postural re-alignment reduces the gravitational pull on muscles, allowing increased range of motion throughout the musculo-skeletal system. The procedure I use to re-align the structure also corrects subluxations. To achieve a more complete correction, adjustments are administered with the patient in various positions: standing, sitting, supine, or prone. Adjustments are also made while putting the patient through various range of motion exercises. This type of dynamic adjusting technique is made possible through the use of the ArthroStim® and VibraCussor® adjusting instruments by Impac, Inc. I also use S.O.T Blocks and a drop piece table. Using these instruments with the Creed Neural Kinetic Integration Technique allows me to achieve better, faster, more consistent results than ever before. KOCH: What are the features of these instruments that help you achieve your superior outcomes? CREED: The Impac, Inc. percussor and adjusting instruments are very versatile, and each has a wide variety of available heads or adjusting tips to allow the doctor to make effective and comfortable contact with any area being treated. Very importantly, the strength and depth of force they generate is totally in the doctor’s control. KOCH: I like them for the same reason. I would add that the patients love being adjusted with them because they allow for such gentle, low impact adjustments. The thing I like about your work and what makes it unique is that it allows us to make multi dimensional functional adjustments that correct the whole body balance, not just the spine. The beauty of this is that the results are often immediate and demonstrable through postural changes that are visible and often dramatic. Equally dramatic are the improvements in pre and post muscle tests that show the patient that something very positive happened. Your protocols are clear, easy to perform and very comprehensive. CREED: That’s it Bill, it’s “show and tell,” with the emphasis on show. KOCH: I couldn’t agree more. CREED: Results are what count. And, as I like to say, that is what gets people to stay, pay, return and refer. KOCH: That is the way I do it as well. Really fix them, and do it fast and economically. Patients don’t come to buy timeshares in our offices. The better and faster we fix them the happier they will be and the more likely they will be to refer. That’s practice building at its finest.